On 27th October 2008, Employment and Support Allowance (ESA) replaced Incapacity Benefit (IB), and Income Support (IS) paid on the grounds of incapacity for work due to ill health or a disability. 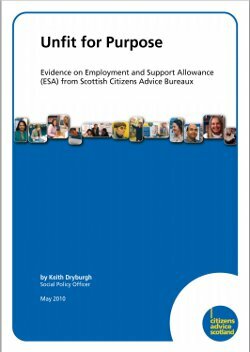 New applicants must now apply for ESA or Jobseekers Allowance (JSA), while existing claimants will be rolled onto the new programme by 2015. .
ESA has become a significant issue for Citizens Advice Bureaux in Scotland. Following its introduction in October 2008, ESA has quickly become the second most enquired about benefit in bureaux, and the fifth most enquired about issue overall. Citizens Advice Scotland (CAS) is extremely concerned that many clients are being found fit for work in their assessment for ESA despite often having severe illnesses and/or disabilities. This report highlights the cases of many clients with serious health conditions who have been found fit for work, including Parkinsons Disease, Multiple Sclerosis, terminal cancer, Bi-polar disorder, heart failure, strokes, severe depression, and agorophobia.